The formula that he has settled into makes the most of the Sunshine Coast at its quietest. Blair, 50, has fond memories of growing up in Coolum when it was a town of 600 people. Now the population sits at more like 20,000, swelling even further on weekends and holidays. Mondays and Fridays are too busy in Blair’s books, thanks to flexi-timers taking days off. He regards Tuesday as the quietest day of the week, and therefore, the best day for Sunday-like activities, like swimming or socialising. It suits Blair to work when the rest of the world is chilling out. “I really like to work through Christmas holidays. It’s like the creative consciousness is all relaxed – you can feel it,” he said. 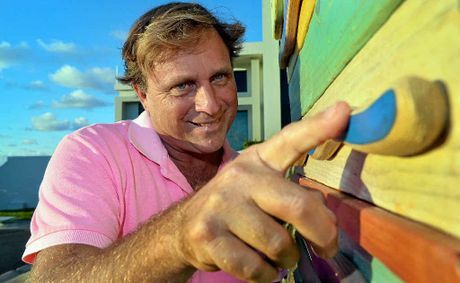 Blair is probably best known on the Coast for his surf-inspired paintings but his talents do not stop there. He is also a musician – playing piano and piano accordion – and a photographer. Well yet everyone be familiar with that buy generic cialis detected with ease in the Internet. In special on our website it is full of it. But you forget and constantly you ask.